Pennsylvania native Tom Caamano has always loved movies, a passion passed down to him through the generations. The 39-year-old fondly remembers going to the movie theater with his father as a child and recalls stories he heard growing up from his grandfather about how movies helped him learn English after arriving in the U.S. from Spain. When it came time to choose a career, Tom followed his passion for storytelling and became a director. In his career to date he has worked on several TV series in various capacities, including in directing, post-production and editing. “I’m basically a jack-of-all-trades,” Tom says. 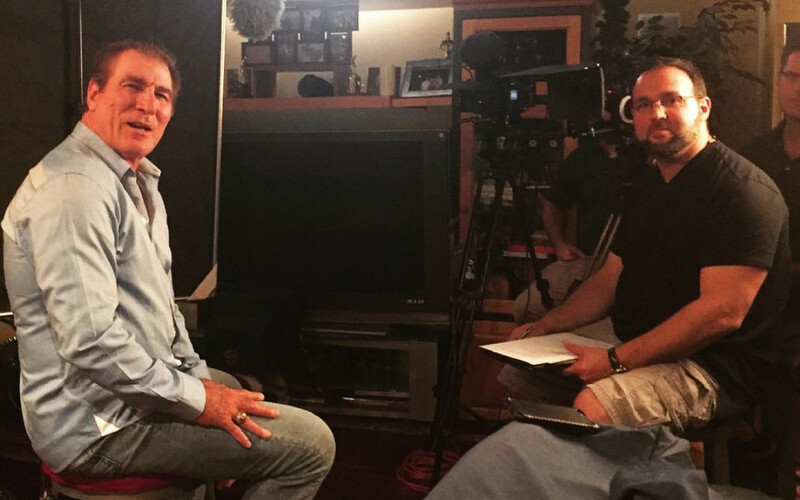 Director Tom Caamano interviews NFL Legend Vince Papale for the documentary Invincible, The True Story. Tom, who received a surprise diagnosis of mitochondrial disease in 2009, perseveres despite symptoms, which include muscle weakness and fatigue, that threatened to derail his career. Today, he is not only thriving, he’s helping others facing similar diagnoses feel empowered, too. Growing up, Tom was athletic, earning all-state honors in football. After graduating from Penn State University, he stayed active by going to the gym, and as his production career developed, he worked a grueling schedule, standing all day with a heavy video camera, traveling constantly and working until late into the night. Then, at age 29, Tom contracted MRSA from the gym he went to. He found himself in and out of the hospital for several months, and, in order to rid himself of the infection, he had to endure heavy doses of strong antibiotics. After recovering from the infection, Tom was back to normal for a few months. Then, seemingly out of nowhere, he started experiencing unexplained fatigue and weakness. Other symptoms included temporary paralysis and a potassium level near zero. This led Tom on a long, frustrating diagnostic odyssey that lasted nearly a year. Although it was a relief to finally get a diagnosis, Tom says, “The first two years were very difficult. The fatigue was intense. I went from good and bad days, to good and bad weeks, then to good and bad months.” Additionally, weakness began to present itself in his hips and shoulders, making holding a heavy video camera on his shoulder difficult. Today, Tom receives his care at an MDA Care Center, from Dr. Terry Heiman-Patterson at Good Shephard Rehabilitation in Allentown, who he says has been a “godsend” to him in stabilizing his care. 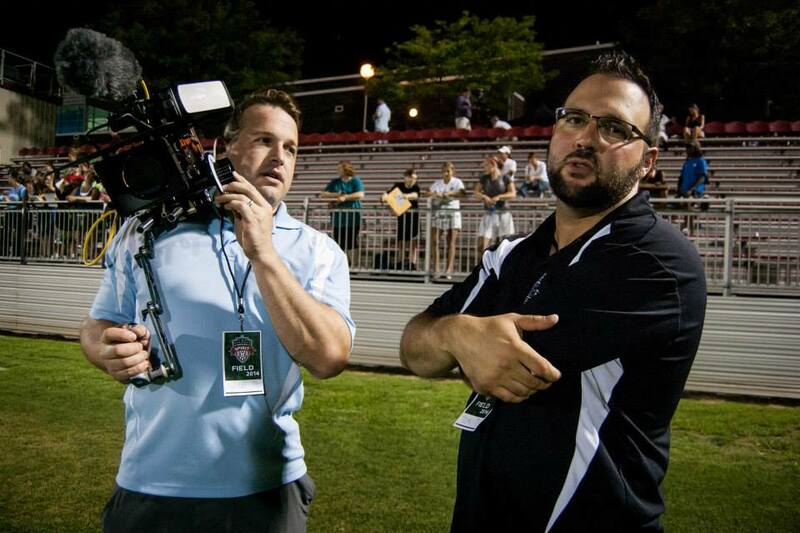 Director Tom Caamano (right) consults with Director of Photography Michael Jordan while filming Ali Krieger and Kerry McCoy in a documentary series, The Keystone Connection. After initially experiencing frustration, Tom developed techniques that have enabled him to maximize his energy level and effectiveness at work. Today, Tom continues to work full-time, mindful of his strength and energy. His latest endeavor is a documentary called True North, about cancer survivor Sean Swarner, who is traveling to the North Pole with a special flag with the names of thousands of cancer survivors on it. Although Tom is not traveling to the North Pole with Sean, he has directed, produced and shot the majority of the other footage for the documentary and is actively involved in its post-production and editing. Sean Swarner and team heading to the North Pole in the Documentary True North, Directed by Tom Caamano. Sean’s uplifting story has helped to change Tom’s perspective on living with mitochondrial disease. He’s seen firsthand the impact Sean has had on other cancer patients, and Tom realizes that if he can have a similar impact on people with his own disease, that is a special feeling. Help Adults Like Tom Live Longer and Grow Stronger!